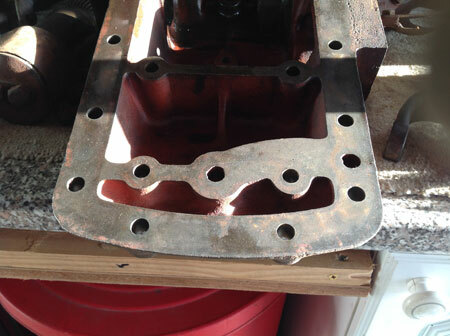 VTE got an email recently from a gentleman who had some irreparable damage to the top cover on his 1955 TEF-20 diesel. The only sollution was to find a second hand replacement. Of course there are probably lots of donor grey fergusons about the country, but it’s just knowing where they are and who has what. Keith thought he’d found what he was looking for and went to remove the top cover from the donor tractor (in a rush on a very cold and wet day). Unfortunately when he got home he noticed that it was different to his original component. Original top cover with integrated relief valve. Keith’s tractor is clearly a model that doesn’t have a relief valve fitted to the pump, but instead has the relief valve integrated into the top cover. If the top cover had been fitted that does not have the integrated relief valve then the system would therefore not have a relief valve which would have caused damage. It is important to note that there were five different top covers fitted to these tractors and three different versions of the hydraulic pump. Thankfully Keith took some time to inspect the donor top cover before fitting it, and is now trying to find a cover with the integrated releif valve. 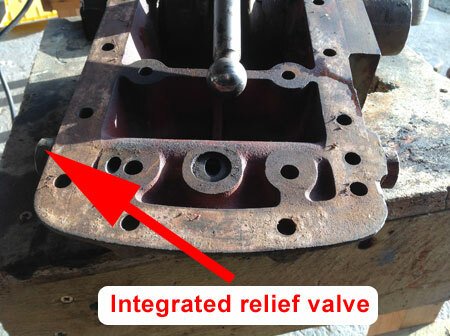 Keith found that his pump had a blanking plate fitted where the relief valve could go. So it was just a case of fitting a new relief valve and then using the top cover that he’d taken off the donor tractor. So all ended well. That’s a fair comment to suggest repairing the top cover. I guess for a lot of people it comes down to economics. If they can get a second hand component for say £80 then it may be just as cheap as getting it repaired. Obviously if you are able to do a repair yourself then it is just the time taken rather than money. It is quite a good topic to read of . I did not know for instance there were 5 patterns and 3 systems in these top covers. Thanks for that. I have to say though. As a welder; if its metallic it can be fixed. What exactly constitutes a claim of irreparable damage to a cover in this case? One of the situations creeping into vintage Ferguson repair is a modern attitude of “nah yuh cant fix that mate, it has to be replaced”. CRA*. These tractors are 98.9% repairable with blacksmithing methods . One could weld up the crank journals and true them with a file ;& still get another 20 years out of it with a careful hand finish. Okay it is not easy and the example is vague and arguable. Still there is a Higher likelihood the cast case on the hydraulics can be repaired very successfully with available tools and materials?